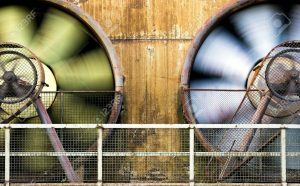 Industrial fans are designed to take contaminated air from inside of an industrial facility and move it outside so that it can be replaced with clean air. However, there are a wide range of industrial exhaust fans that are available to those who need one, so when shopping around for one, there are some things you’re going to want to keep it mind. It will allow you to pick out the ideal exhaust fan for your facility. The first factor to keep in mind is the fan model. Different fan models will perform different functions. For example, direct drive fans require very little maintenance and are perfect for smaller spaces, while belt drive fans are equipped to handle a larger amount of air everyday but will require some extra TLC from those who use them. Additionally, propeller fans can move a lot of air at once, but they are noisier than centrifugal fans and are not as efficient as they are. The second factor is CFM, or cubic feet per minute, which is a calculation that determines how large an exhaust fan needs to be in order to move air in and out of a facility. Different rooms will have different requirements when it comes to how quickly the air inside of them needs to be changed through the use of an exhaust fan. By crunching some numbers and figuring out how often you’ll need this change to happen, you can pick out an appropriate fan. The third factor is static pressure. Your exhaust fan is going to need to exert a certain amount of energy to overcome the static pressure that exists within the ductwork in your industrial facility, and it needs to be able to meet the demands that are in place. Therefore, an accurate reading of the static pressure that exists should be taken before picking out an exhaust fan. Lastly, the final factor is the sound level of an exhaust fan. If you work in a large facility that is always noisy, the sound that a fan generates probably won’t be an issue for you. Nevertheless, if you need an exhaust fan that isn’t constantly making noise, then you’re going to want to do your homework and find one that keeps sounds to a minimum. It can be difficult to find an industrial exhaust fan that meets all of your needs and does its job effectively within your facility. Dynamic Fan can help you select one that will check all of the boxes and ventilate your industrial space as efficiently as possible. Reach out to us at 973-244-2422 today to hear about the excellent industrial exhaust fans that we have in stock.